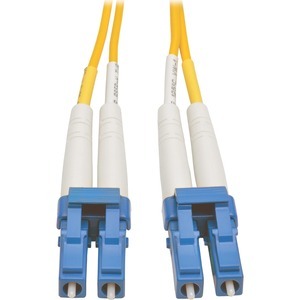 The N370-20M Duplex Singlemode 8.3/125 Fiber Patch Cable transmits fast, clear data signals through your LAN with a higher bandwidth than multimode cable for up to twice the throughput. 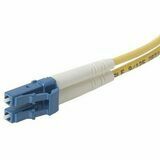 Designed for network equipment that requires singlemode fiber optic patch cables, this 20-meter (65-foot) cable has attenuation loss that meets or exceeds current standards. 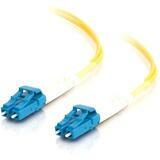 The N370-20M has 8.3/125 duplex (zipcord) fiber made from glass, instead of polymer. The sturdy LC male connectors meet stringent insertion loss standards and feature beveled edges on their glass ends for easy insertion into a patch panel or switch. The FDDI- and OFNR-rated PVC jacket is yellow to easily identify it as a singlemode cable.